What were once steps now look more like a ramp. We got a good 6 or 8 inches or snow, judging by a glance out my bedroom window. I didn't shovel at all yesterday, so I'm crossing my fingers for some machinery with a blade or a bucket to appear today. It could happen! It alternative between rain and snow all day yesterday. It was funny. Whenever the temp went up around 32 it would snow, when it dropped down to around 28 it would rain. Go figure. Did I mention I'm playing the Bass Festival with my old pal and duo partner Tommy T? That'll be a blast. It's in June in St. Mary's. We'll play a local club the night before, too. T lives in Nashville, but he'll be up in Wheeling for a family visit in March, so we'll get to practice. How about a picture? This was taken with my little digicam. 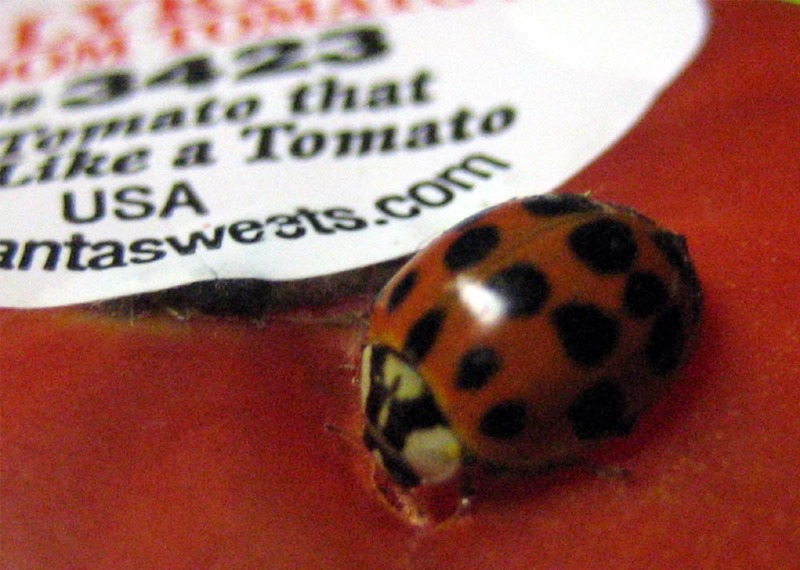 The ladybugs around here love tomatoes. They'll attack the ones I leave on the window shelf in my kitchen within a day or two.